I've mentioned before that my husband is a member of a local charity organization. Each summer they host a Summer Gala to thank our generous sponsors in a more intimate setting before our big ball in November. Between the ball, the summer formal, and all the other holiday parties, I stay on the look out for formal wear year round! I found this dress by Mandalay at the Neiman Marcus Last Call Center at the end of last year for $468. I know that compared to the original $1535 price tag, the reduced price would seem very reasonable. However, I am married to New Spock and that price is just something that no amount of logic could justify. In February, I was back and browsing their sale section and it was now reduced and color coded for additional savings, plus I had a coupon for their President's Day Sale. 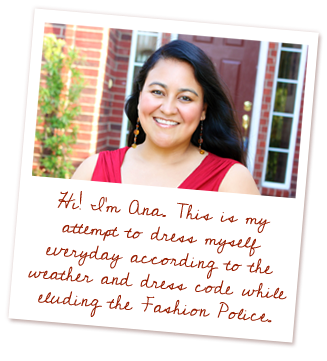 The dress cost me $133!! My husband refers to this as the dress I "stole" from Neiman's, he says $133 is what the taxes would have been on the original price. When I brought the dress home, I thought I would pair it with my bronze shoes and clutch (seen here) because I thought the dress was bronze. While getting it fitted for the summer formal last week, I realized that it's is not bronze but rose gold and none of the bronze accessories match. So I started shopping. Back in June, a friend found the above pair of Ivanka Trump glitter pumps and fell in love with them on the spot. I thought they were cute, but I had nothing to wear them with so she purchased them and took them home. I can't help but think that the rose gold heels would now be perfect for my dress, but the glitter might be a bit much for my already very busy dress. 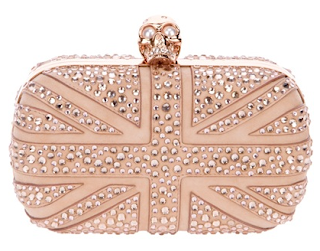 I also went in search of the perfect clutch and was handed first a $2200 Alexander McQueen clutch that was perfect for my dress, but nearly made me pass out when I read the price tag. I found a photo of a similar one, but can't find the right one anywhere online. When I advised that sales associate that I had a more modest budget, she brought me back a $650 Jimmy Choo glitter clutch. I told my friends, I should have started at Target. 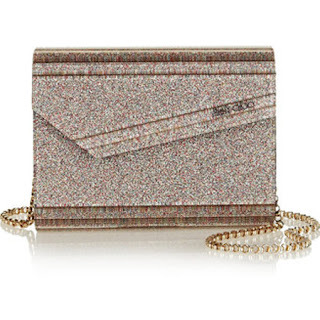 Coincidentally, the glitter clutch would be a perfect match to the Ivanka Trump heels and I have plenty of rose gold jewelry from my earlier bouts of BaubleBar fever. i love the shoes and mcqueen clutch!!! I know! 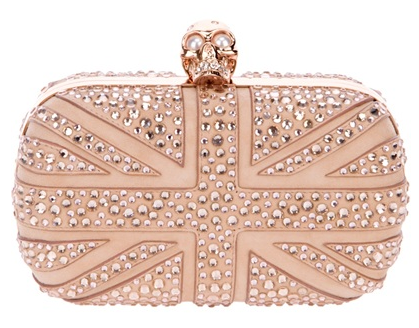 I think for a while, a McQueen clutch will just be aspirational. I only recently bought my first McQueen piece and it's a silk scarf. hahahahaha! I might have died of shock right then and there if he had.